If wedding dresses that are in pure white can hardly attaint your heart, then colored wedding dresses can be the alternatives. In spite of the most chosen color, vibrant colors such as corn yellow, horizon blue, ice blue, pink, just to name a few which are worthwhile of your consideration. Otherwise, the darker color of the range of black may serve your purpose better. Here we provide minute examination of wedding dresses in different colors, which is intended to help you to narrow down your choices and find the one that wins your heart and to spread the culture of wedding gowns. According to the great philosopher Michel Foucault, darkness provides protection. The statement can be translated as another interpretation of the black power. Black is laden with mystery. It fire human curiosity to uncover the secrets behind it, and, simultaneously, we are haunted by fear of what to be revealed. Due to the concerned efforts of such desire and fear, we feel more attracted to the black color. It is, in no small part, the origin of the charm of black wedding dresses. The black dress denotes self-confidence, self-discipline and resilience; it also connotes elegance, strength, authority and sophistication. More importantly, a black dress can make you appear slimmer and thinner. 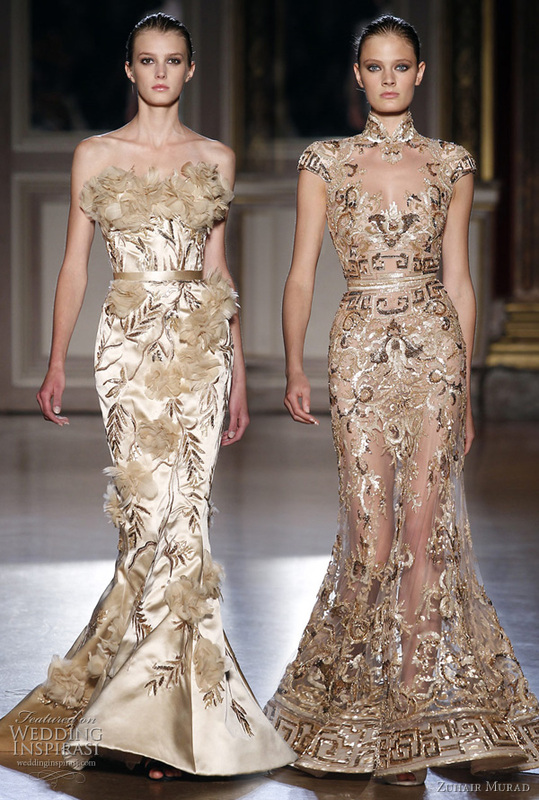 Due to brides’ dream of a sunny wedding, it is no wonder that the last few decades have witnessed a sudden rise of gold wedding dresses in popularity. What accounts for such a trend? And what makes gold so trendy? The driving force lies in the symbolic meanings of the color—gold. You may hold that the fancy for gold is an anachronistic hangover from the old days, but you can not deny gold of its remaining one of the most vibrant color in fashion industry. The sight of gold first reminds one of the shining sun and then the sparkling gold bars, so gold has the symbolic meanings of happiness, achievements, prosperity and true friendship. Talk has it that a friend tested is a friend indeed, for which the reason is that gold can stand timeless tests and remain the same. Such loyalty and persistence can beget due rewards for the one of similar personality. However, as for gold wedding dresses, they are chose essentially to disperse obstacles in life, because it illuminates everything by shedding rays of optimism. Thus, it indicates a smooth marriage. Pink means universal care and love. Pink is produced by the blend of white and red. How it looks and how much energy it breezes depends on how the two colors are combined. While white indicates latent fullness and red makes it possible to reach that potential, these two powers are combined into pink. 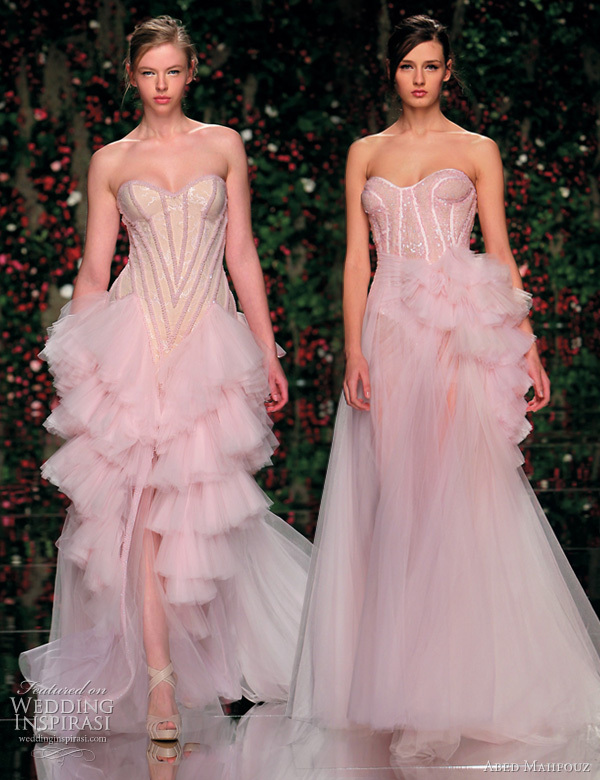 What the pink wedding dresses can bring to the brides are sweetness, romance, softness, innocence, youth, tenderness, and care. Such dresses will make ladies more impressive and charming. As the color range can not be exhausted, what has been discussed above is only a fraction of the meanings of colored wedding dresses. If you are interested, please find more about color wedding dresses that entertain you. All in all, bride-to-be want to have the traditional wedding then you can find the white wedding dresses online here and there and you can also find the affordable amazing bridal gowns at dressesmall, below are the pictures of dresses that sold best online. This entry was posted in Wedding Dresses Home and tagged Colored Wedding Dresses. Bookmark the permalink.